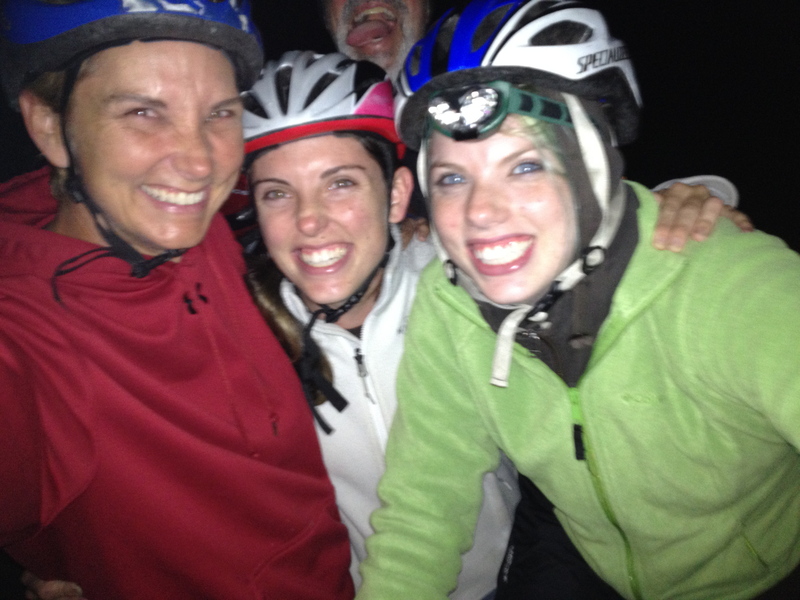 Moonlight Ride around Cade’s Cove – Happy. Healthy. Heathen. 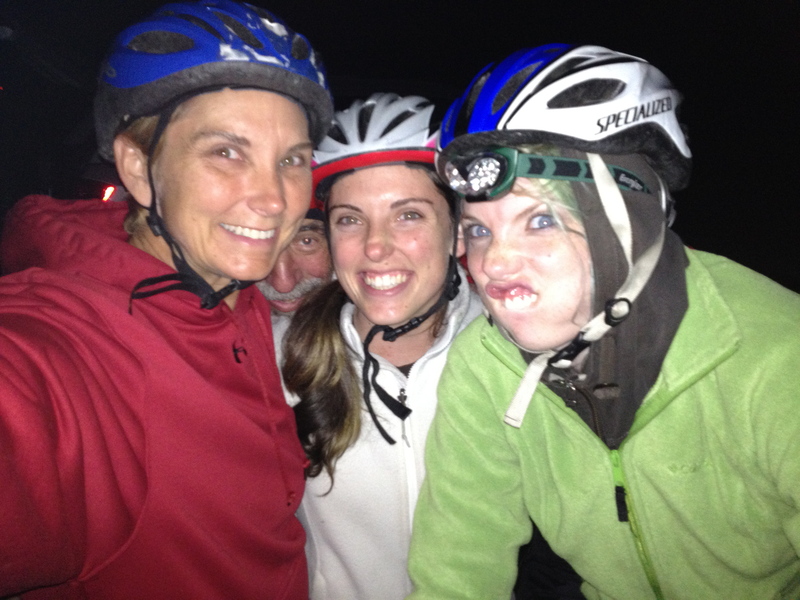 And following on the heels of the Warrior Dash…crazy, moonlight bicycle ride in Smoky Mountain National Park. When Sam began college at UT in the fall of 2006, he began work at the UT Outdoor Program (UTOP). I believe that it was through this group that I first heard about this ride. Cade’s Cove is a beautiful plateau in the Smoky Mountains, protected on all sides by mountains, and according to the site, is one of the most visited place in the National Park. On a pretty fall weekend, the loop is almost entirely filled with cars, creeping along looking at the flora and fauna. Like most state parks, the road closes at dusk, and that’s when it gets interesting. On a full moon, if you’re on a bicycle, you can see well enough to navigate, even without blinkies, on the 11-mile loop. What. A. Rush. Saturday night’s full moon was occasionally partially occluded by clouds, and sometimes diffused by a heavy fog that gave everything a kind of scary, surreal feeling. There are old buildings along the road, and we stopped to see one of the old churches. It was here that we discovered Eliott’s flat tire. While Amy and I were working to patch it, Eliott scared the poop out of Casey by tossing stones into the woods while Casey tried to figure out what it was. 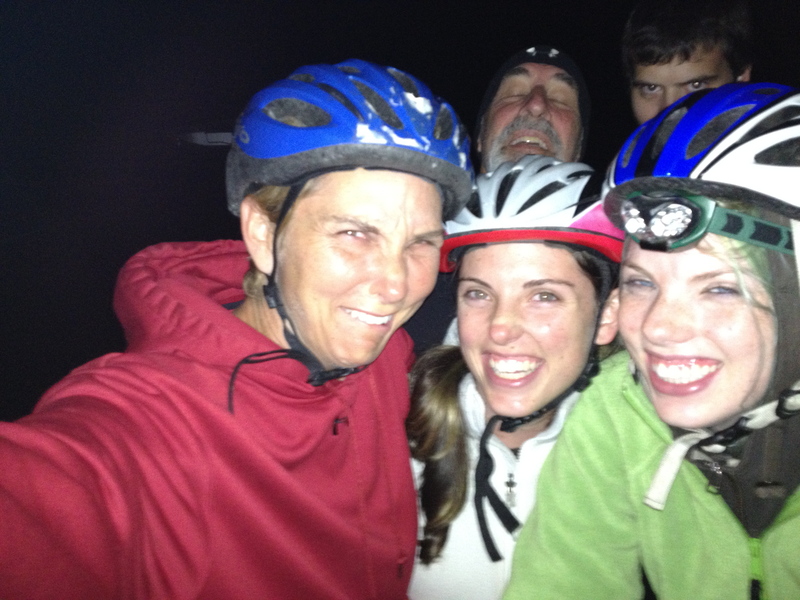 We also got several packs of coyotes to answer back to our howls – pretty scary in the dark and moonlight. The black bear sighting was the highlight. We try not to use headlamps or white blinkies because you can see more if you let your eyes adjust and dilate to the moonlight, but after watching the large dark figure walk toward us across a field, we finally shown a light, and there he was. We left in haste, with Casey beside me saying he didn’t have to outrun the bear, but just be able to outrun me. We stopped at the working mill, and the other pioneer structure, seeing bats, and deer, hearing the coyotes, and straining for every bit of road definition out of the shadows of the moon. We stopped at the part of the valley where you can hear an echo bounce back and forth across the ridge, and clapped and whistled and hooted until we needed to get back on the bikes and finish the loop. 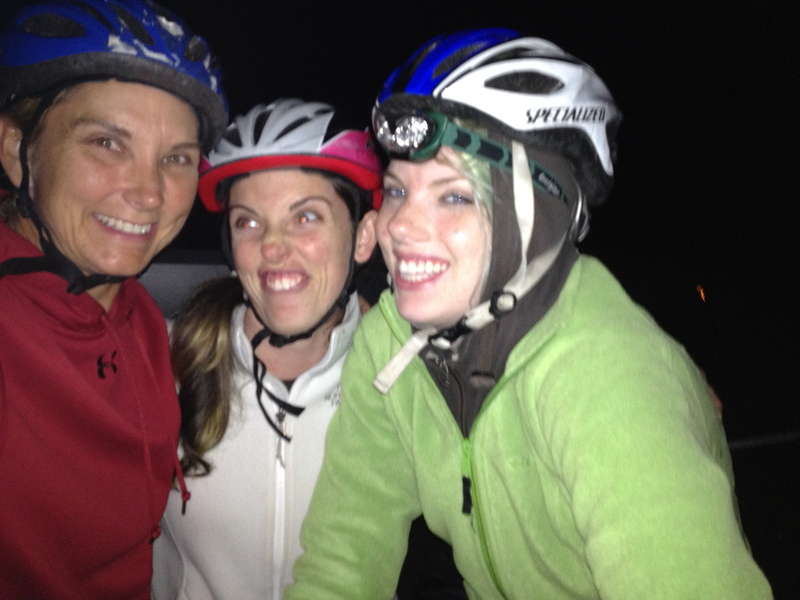 We didn’t start riding until midnight, and between the flat tire and sightseeing, it was 3am when we got back. I love this ride. Going without a night’s sleep is a small price to pay for the memory of the experience. It’s become one of my mental happy places to wander to when I need a refuge from stress and life drama. The whisper of my tires on the road, the cool air on my face, the muted outlines of the fields and mountains, all come together to create a unique, unforgettable carpe nocturne event. If you see me post that I’m making the trip again, ask to come along. Oh, and my daughters and I are apparently 9 years old. Stop clowning around, this one’s for real! Seriously, y’all, I want a good picture of us!